Sometimes, a great dinner doesn’t require much effort or planning, it just happens. 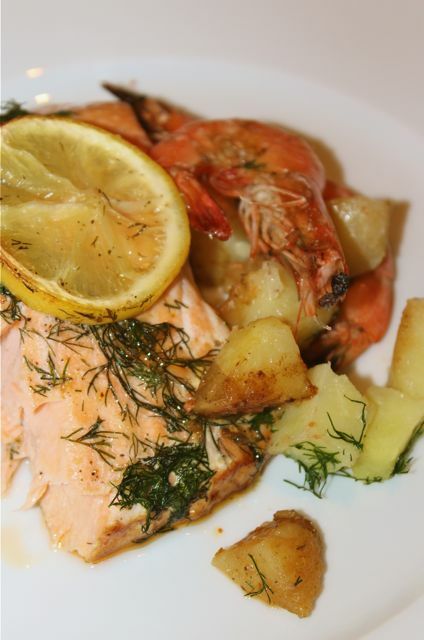 :) Here is a rather elegant salmon and shrimp dish that we had last week — it took less than 30 minutes of prep time and would have easily served eight guests. A fresh warmed baguette, a green salad and a bottle of white wine completed this impromptu Friday dinner with a couple of friends. Earlier that week, we had purchased a whole salmon at the seaside market, where my suki expertly filleted the body and prepared the head for sinigang (sour soup). One whole salmon fillet was turned into two portions of gravlax, and we had to figure out how to use the other large fillet. We deboned the fillet, cleaned it up a bit and placed it in a large ceramic baking dish. Next, seasoned it with salt and pepper, slathered it with lots of butter, sprinkled it generously with whole fronds and chopped fresh dill, and added some lemon slices. I stuck this into a pre-heated oven at 400F or so. Meanwhile, I parboiled some baby potatoes or medium sized potatoes (slice them after they are almost cooked). 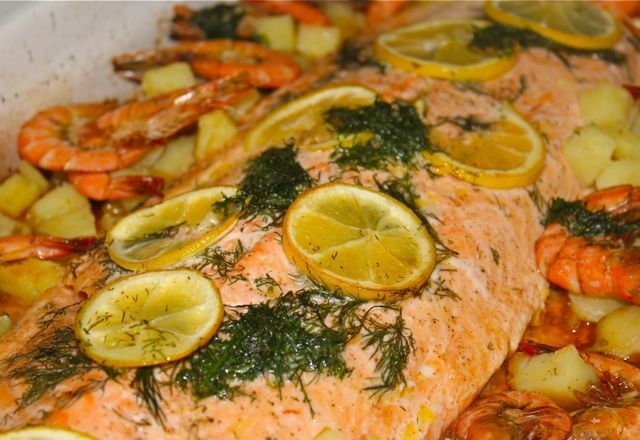 When the butter in the baking dish is melted and sizzling (after about 12-15 mins), add the potatoes to the sides of the salmon, add say a half kilo of white shrimp or suahe, and season with more salt and pepper. I figured this entire dish cost roughly PHP1,000 to make, plus salads and bread, resulting in a total cost of say PHP1,200. For 8 people, that came out to an average cost of PHP150 (US$3.50) per person! People ask me why I don’t eat out that often in Manila… it’s because with home made meals like this, why do battle with traffic, parking, expense, etc. unless the meal is something that isn’t relatively easy to replicate in one’s own kitchen? This is so simple and looks yummy! I will try this next time with my salmon fillet. Marketman, that’s my kind of feast! Would you mind sharing which seaside market this is? And while you’re at it, where does one get fresh dill? Thanks in advance! Maria, Seaside market is located in Baclaran, near the church. I have written about it before, here and here. As for the dill, you can try S&R, Rustans and or Santis for small portions for sale. Weekend markets often have them as well… Salcedo, FTI and Legaspi markets are good bets, I have written about them previously as well. At the outdoor section of the Market!Market! Mall in Fort Bonifacio, look for the fresh fields stall and they often carry dill as well… it isn’t common, but it isn’t that hard to find either. MM care to share tips on how not to overcook salmon? Baked and grilled salmon are my waterloo. Agree with you on eating in instead of going to restaurants where i will alawys be disappointed, either with the taste or price of the food. Wow! That’s way better than going to a fine dining restaurant. Looks delish! Looks really good. I love to eat fish especially salmon. Alhtough it’s one of the more expensive fishes in the market. Off topic but the Saveur Best Food Blog awards are to be awarded soon. Nominations begin on March 6 so can all faithful readers please put in a nomination for MM. Finalists will be announced March 28 and voting begins April 5. For more details see Saveur.com. But please, support and vote for your favourite blog! I prepare salmon almost like this… only I put chopped garlic, white wine and capers with a side dish of broccoli rabe sauted in olive oil and garlic. I do mine this way. Coat the salmon with mayo till you don’t see the salmon color. Bake and when almost done sprinkle with cheese all over on top and broil till the cheese is melted. You may also sprinkle chopped nuts like almonds or walnut for crunch. Perfect for Lent. I want to eat it now. I bake my salmon with mayo and sinigang mix. slather the mix all over the top of the salmon and bake uncovered. Time depends on the size of the salmon. Yummy. pioneer woman.com… she has perfect way of baking salmon,it always works. thanks again marketman for your great ideas! MM, are you particular about what kind of butter you would use in a dish like this? Just curious. 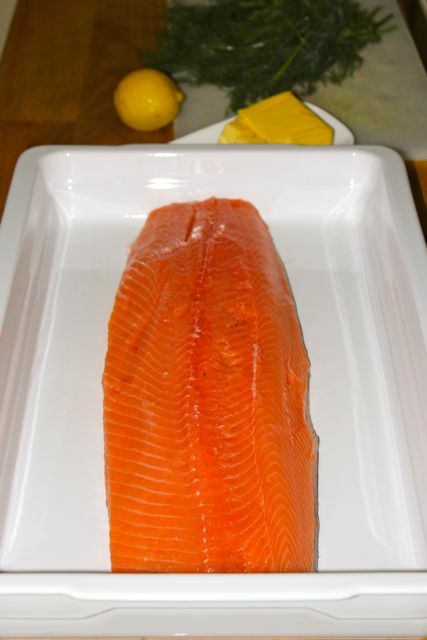 Marketman and Passive.observer: one of the avid fish cook here told me a good tip how to bake moist, soft, and not overcooked salmon: 400F for just 16 minutes! Love this MM, droolworthy pictures. I totally agree on the not eating out too much…a lot of restaurants are a rip off for the quality and taste that you get (although of course there are some excellent restaurants…but you have to come ready to pay hehe). Plus when you eat at home you know exactly what goes into your food! I love salmon with miso,soy sauce and brown sugar sauce or miso and sriracha sauce, it offsets the richness of the salmon really well. 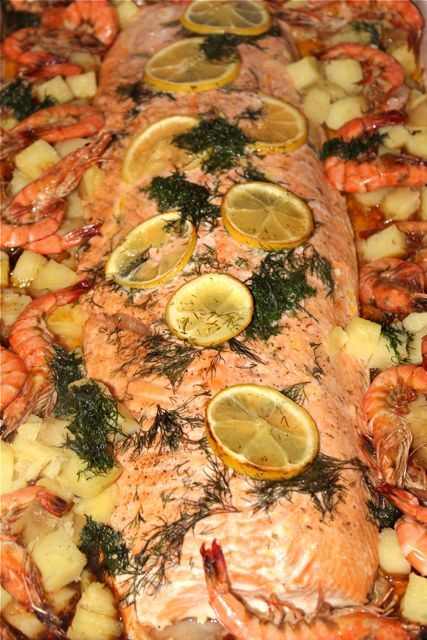 titanons – I think that is almost how Conti’s makes their baked salmon. Just subtract the nuts and add in a lot of garlic and it’s more or less the same. Fat Tuesday, what an opportune time to bring up a typical lenten fare. Although many have dropped all pious practices a long time ago, the last vestige of any strict Catholic upbringing, I notice, seems to be that of meatless Fridays. Still healthy and chastening even for lapsed heathens. But where is the salmon from? That’s a logical step since besides lechon, Cebu is also famous for fish, danggit and roadside grilled fish. In fact, vendors tending to fresh looking fish hissing over their portable grills and the towers of otap tins on the dockside are the first images that come to mind when I recall my passage there. Would not at all mind forsaking Zubuchon for a limited time for say, escaveche or your sarciadong daing from 2006.
like you, we don’t eat out often. in my mind, better pa our food at home than those outside. but if it’s a dish na super-hassle to make, we eat out. so many times, i’m sorry pa to have gone out to eat. the rice is usually not that good, i’m so tempted to bring my own! there was a time when the restaurant charged us for japanese rice which wasn’t even close to that variety. your photo is so inviting. and it can be served for the holy week … today being ash wednesday. i’m thinking naman, regarding abstaining from meat as a sacrifice … is having this dish a sacrifice since it’s not meat? most probably not … hahaha! marketman: sorry for not including the thickness gauge of the salmon, 1 inch at 400F for 16 minutes. hope that helps. very timely, i also bought a whole salmon, thanks MM! agree with you 100%, may sound like an anti-consumerism advocate, but really just a DIY mom! :) we also don’t eat out much unless circumstances call for it or the food must really be so special. baking is also one of my favorite ways in preparing fillets of fish, but your photos look so much more delicious, hehe! I love that you include estimated cost per dish and per person when blogging about your recipes. Home-cooked meals are the best!